It’s been a little while now since I’ve done a proper photography critique on the site or my Travel Photography YouTube Channel. And since I’m just chilling a bit here in Switzerland, I thought it was time. I was lucky enough the have been allowed the opportunity to critique the works of one Jeff Bartlett of Adventure Freelancer fame. Jeff is a Canadian travel photographer, and a damn good one at that. I’ve known of Jeff for a while, and have always been impressed with the quality of his work. He’s got a great eye for composition and has been doing some amazing things. And, of course, he’s an absolute star over at Instagram as over 20,000 people follow the guy. I really want to thank Jeff for opening himself up to the photo critique. I know how hard it is to hear someone rip apart the photos you love so much, but it’s a part of perfecting the art. I’ve had images I took that I loved, then had someone critique them and now I can’t look at them anymore. But that’s not what this is about. No image is perfect, and often it’s the imperfections that make the image special. However, getting another person’s constructive criticism is so important in developing your skill. If you want me to do a critique on your work, there is information in the video, and at the bottom of this article. Anyways, check out the video of my critique of the work. And if you prefer to read about it, you can follow along with the video and then check my notes below. This image is pretty close. The one minor flaw that jumped out at me right away, though, was the symmetry. It’s not off by much, but if you look at the very top of the image, you can see that the line is just off to the left. If you’re going to do an image like this, the symmetry has to be spot on, especially if you’re using that symmetry as a leading line. Of course, it’s hard to get it right when looking at it through the tiny viewfinder of a camera, though. Fixing this would have been done by just stepping to the left about a foot or two. The other minor issue is the noise I see in the sky. Now, I can tell this image was shot a bit too late in the evening, I think it would have been more powerful right at the end of the blue hour when you could have shot an ISO lower than 800. I think you would have got more colour in the sky, too. Still, this is one of my favourite images of Calgary I’ve ever seen, so I can’t complain. It’s a really powerful image, and I love the composition. This is a GoPro shot so it’s obviously not something that was easy to take. Thus, any of the composition issues that it may have are likely a matter of shooting blind. That being said, I think that there should have been some cropping done to fix a couple of the issues. Generally speaking, we try to stick to the rule of two thirds or symmetry, and none of the subjects in this photo are at two thirds. 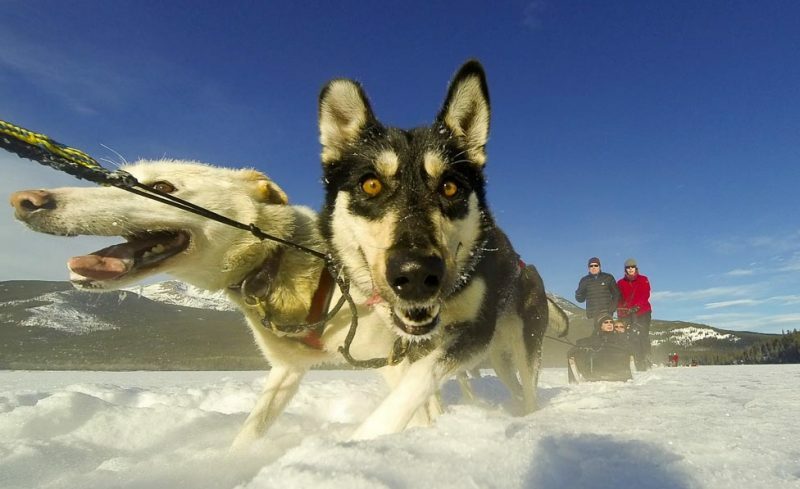 The main dog isn’t, the sled isn’t, and obviously the other dog can’t be either. Moreover, the horizon also runs right through the middle of the image. My other issue with the composition is that there’s too much empty space at the bottom of the image and to the right of the subjects. I’ve made a cropping adjustment quickly in paint, and I think this crop would be more impactful. Personally, I think the cropped image not only fixes some of the composition problems like the empty spaces on the bottom right and top of the image, but it also puts us closer to the subject and gives us a more personal feel. On top of it all, it puts the sleders and horizon at 2/3rds and the dog’s face right in the middle of the frame. And added bonus is that it crops out your shadow that was in the foreground. It’s the little things in a photo like this, and following some of the rules of composition will help fix these minor issues. I like this image. I like how it’s lit fairly naturally by the ambient light of your surroundings. I like the symmetry of the composition and I like the mood it exudes. If I was getting picky I’d say that it could have been shot ISO200 and 30seconds for a less noisy image (there’s a bit in the sky). The one thing that bothers me a bit is the colour cast. I’m not really a fan of the warm pink light in the image. I would have edited it so that the snow looked white and not like it was peed on by a member of the Care Bears. Of course, I’m a bit of a photo purist and there are a lot of people who like this type of look. Also, I’m not one to judge one’s process. If you like the look of the pink, it’s your style; cool. If it was just by accident, I’d probably touch it up. I’m usually the guy that harps on the fact that landscapes should only be shot in the right hours of the day (around sunset and sunrise), but I can live with this shot being taken in the middle of the day. And, actually, I really like the image. I like that you used the rule of 2/3rds for the dock, I love the how the mountains look, and I like the perfect spacing of the people on the dock. Now, well I don’t have much to critique with this image, I would like you to try to focus on perfecting images. This image is great, but what would have been made it perfect is if the 5 photographers on the dock were all holding the same pose. The three guys on the right have it, but then the two on the left don’t. Now, in most cases I’d say that this is our of your control as a photographer. But, my guess is you were working on a tourism project here and were involved with the group on the dock. If that’s the case, you can’t be shy. You have to ask them all to hold a pose for you so you can perfect the image. You set a great scene here, now perfect it. Of the group of images, this was likely my least favourite. I actually like the scene, but it’s just the wrong time of day to be shooting this sort of landscape. I can tell, too, that you edited it pretty hard to try to compensate for the dulled colours and contrast. If you look at the grass off to the side of the images, the details are really smudged. I want to see crispness to an image or else it starts to look like a water painting my mother made. Also, the mountains and that heavy blue cast to them doesn’t really work for me in this shot. Another thing to the image is there are some sensor spots which I pointed out in the video. No biggie, and an easy fix in Lightroom. I like this image. For me, it’s pretty spot on. I like the focus on the photographer out the window. It adds a nice layer to the image. It’s so important in landscape photography to create scale by putting something in the foreground, and you did that well. From a composition standpoint it’s really nice. I like the way it was set up, and I know how hard that is to do on a moving boat. I think you used a polarizer on this shot too (if not just got a great sky) and it actually works shot in the middle of the day. If I was getting really picky I’d wonder what an f/5.6 shot of this scene would have looked like. It would have narrowed the focus down on the photographer and maybe given even more depth to the image, though I’m not convinced you didn’t shoot it right at f/8 anyways. Truth is I’ve seen much better images that you’ve taken of Moraine Lake. So, I’m a little bit curious why you chose to show off this image. For me, the composition is way off. Starting at the bottom of the image, there is way too much empty space. Then you get to the boat, and although they are at the 2/3rds mark of the photo horizontally, they are smack dab in the middle vertically. I would have shot this with them moving into the scene. It would have given the impression of them entering the playground that is Moraine Lake. And then, at the top of the image, the mountains are actually cropped too tightly for me. There needs to be a bit more sky for this type of image, in my opinion. To fix it, you could have shot a bit higher, or just rotated the camera to get the boat in the first third. More than the composition even, the light is what kills it for me. I want to see some drama in my landscape photos and I just don’t see it here. The colours are washed out, and then it looks like they were over-processed in an attempt to bring them back to life. There are loads of artifacts in that blue sky, too. Now, some of that might have come from jpeg compression, but I think lots of it comes from the post-processing, too. I can’t say it often enough: landscapes need to be photographed in the soft light of early morning or late afternoon otherwise they’ll always just look like snapshots. For me, this image is a snapshot. This is great for me. You’ve really nailed it from both a storytelling and composition standpoint. You don’t just have a photo of an elk, but one that is calling, giving it some action. Also, the fact that you placed the elk at 2/3rds and didn’t crop it off too tightly gives the scene some breathing room to play out the story in the imagination of the viewer. The light might be a bit harsh, but it’s soft enough that there’s nice contrast to the colours. If the elk is sharp, it’s a great shot. My only minor grievance with the image is the black spot you see in the left of the photo. For me, that area void of details is a bit of a distraction. Look, from a composition standpoint, you nailed this one on the head. The break in the mountains is at 2/3rds, the horizon is at 2/3rds, there is nice reflection, and the foreground is nice as well. Unfortunately, that’s the only thing nice I have to say. For me, the processing is brutal. It doesn’t do Edith justice. Now, it’s really hard for me to tell what time of day this was shot. But judging by the shadows in the foreground, it was still somewhat near the good light, but maybe just a bit too much into the center of the day. As a result, I’m guessing you had a massive issue with shadows and bright light. This is the reason you had to process it so hard, right? You tried to bring the highlights and shadows back lost to the bight and dark spots in the image. Well, it’s just not doing anything for me. I mean, if I look at the blue sky, I can actually see rectangles of artifacts created by the post-processing. I don’t know what to say other than what I say all the time in regards to landscape photography: shoot the right light, then you don’t have to fix it in the processing stage. If you where having trouble balancing the light of the sky and the dark of the foreground, get yourself a good Gradient ND filter and it’ll help correct that a bit too. But yeah, shoot the light, don’t edit it. Moreover, I think there’s a pressure to over-process images because it gets a reaction. But if you shoot the dramatic light of early and late in the day, the image will speak for itself. Camera Settings: Nikon D800 | Lens: 24-70 f2.8 @ 28mm Shutter: 4″ | Aperture: f/11 | ISO: 1600 Location: Nothing like camping in the provincial capital, Edmonton, Alberta. I like the scene. I think this image had the potential to be extremely dramatic. Technically, it’s sound. In fact, all of your images are technically sound. You shoot nearly everything exactly right in the camera. I do think, however, there was an opportunity to make this image even more dramatic. If you wanted to bring the stars out more you could have created 2 images (one for the sky and one for the foreground) and blended them together. I think if you’re going to shoot the stars, you have to really bring them out or it’s pointless. If you’re not going to get the stars, get way higher than the tent and shoot downwards to show the scale to the height and location to where you are. As far as the model is concerned, I would have had him turn about 45 degrees to the camera so we could see his profile. It’s a better angle. In fact, I might have even tried putting him on the edge there with his legs over the edge (and lit him up with a flashlight during the exposure) to add a little more drama to the image. Want your Travel Photography Critiqued? I know I was a bit hard on Jeff, but that’s only because I know this guy can bring it! The better the photographer, the harder I get on the critique. With a guy as talented as Jeff, I want to see near perfection on each image. Anyways, I promise to be constructive if you want your images critiqued. If you do, set up an album on flickr with 5-10 images you want me to critique. If you don’t have flickr you can also upload them to a blog as long as you include the photo data for each image. Then, head to my contact page and email me the link for the album. I promise, it’s good practice for you to be critiqued. Well, I’ve got some photography gear to review for you over the next couple days! I’ve got some new toys including the TriggerTrap, and a new Travel Tripod! I’ll also have some on location stuff from here in Switzerland, so stay tuned. I’ll catch you next time! Next ArticleChoosing the Photo Editing Software that’s Right for YOU! Love your photography Brendan. How do you protect your photos on Instagram? Couldn’t someone steal them? Now, I don’t. The files I upload online are pretty low resolution so I’m not at all worried. Theft, in photography, is a form of flattery, I’m not stressed about it happening.